Nothing to take in and out of your towed vehicle and there's nothing to push, pull, set, adjust, activate or deactivate! 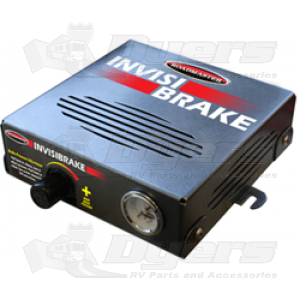 InvisiBrake is a fully automatic, progressive supplemental braking system that uses the electrical connections already in place on your towed vehicle (the towed vehicles electrical harness) to brake when you brake your motorhome - the same electrical signal that activates the towed vehicle's brake lights also activates InvisiBrake. InvisiBrake is so small it can usually be mounted under a seat without sacrificing any of the vehicle's usable space. When you continue braking so does InvisiBrake. The longer you apply the brakes in the motorhome, the harder your tow vehicle will brake (InvisiBrake will NOT skid your tires). InvisiBrake connects directly to the towed vehicles battery during towing - InvisiBrake will NEVER drain the battery. Controller Size — 8¾" x 8¾" x 2¾"
Invisibrake includes and LED monitor for a visual reference of braking activity; an audible alert in the motorhome indicates extended braking to warn you if the brakes have been active too long. Active only when motorhomes brake lights are active - NO false braking! Easy adjusts to individual braking preferences - adjustable from 5 to 80 psi. LED monitor with audible alert. $720.00 To see product price, add this item to your cart. You can always remove it later. What's this? Dyers have the best price and fastest shipping. The invisibrake by roadmaster is a great product but installation will take the whole day. Instruction is straight forward and unit is of good quality. I guess a day to install is better that having to install & uninstall a portable unit every time I go on a trip. Great Service and price from Dyer's. Would definitely use them again. So far the Invisibrake has worked fine. I also had a problem with the lights on the toad and was told to pull the fuse. Checked with Roadmaster and they said that they had never heard that before and that it shouldn't be necessary due to a diode that is in place to prevent any such problems. A bad diode was the cause of the problem. The Invisibrake sure beats a tow dolly or bulky front-seat brake unit. Nice system, but compare it to the SMI brake system. DYERS online is outstanding, they have fast shipping and GREAT prices! ! ! Will purchase from them again. I purchased an SMI stay n play for myself and installed it in my dodge ram to tow. Then I had a friend want this roadmaster invisibrake installed in his 2012 grand cherokee to tow, so I have installed and worked with both now. The SMI system has an accelerometer built into the system, it requires both, a brake light signal and decceleration to activate. The Invisibrake only uses brake lights to activate. The SMI system is wireless operation, the Invisibrake requires an umbilical cord hooked up between RV and toad. The SMI has a control box mounted on the dash of the RV with indicator lights and adjustment settings, the Invisibrake only has a light in the dash of the RV to indicate that the brakes are applied. Both systems work the same, a vacuum pump energizes the brake booster in the toad and a cable pulls the brake pedal down to apply the brakes. The SMI system makes one attatchment to the fire wall for the end of the cable, the piston actually mounts to the brake pedal. The Invisibrake needs two attatchments to the fire wall; the end of the cable mounts to the brake pedal, then a pulley mounts to the firewall, then a cable clamp mounts to the fire wall and the piston is then mounted somewhere else. Either way you go, both of these brake systems are completely functional and in my opinion are much easier to use compared to the brake box that has to be set up each time you tow and removed when you arrive and want to drive the toad. If I had to install another brake system in a toad for me, I would go with the SMI system and I would recommend it to a friend over the Invisibrake.